Where is the best view in London? There are many contenders. Some would say the view of the Houses of Parliament from Lambeth Bridge, others the sight of Sir Christopher Wren’s masterpiece, St Paul’s Cathedral, and the City of London from Waterloo Bridge. Then there’s the splendid prospect from the bridge over St James Park Lake, actually two splendid prospects, Buckingham Palace to the south-west and Horse Guards to the northeast. 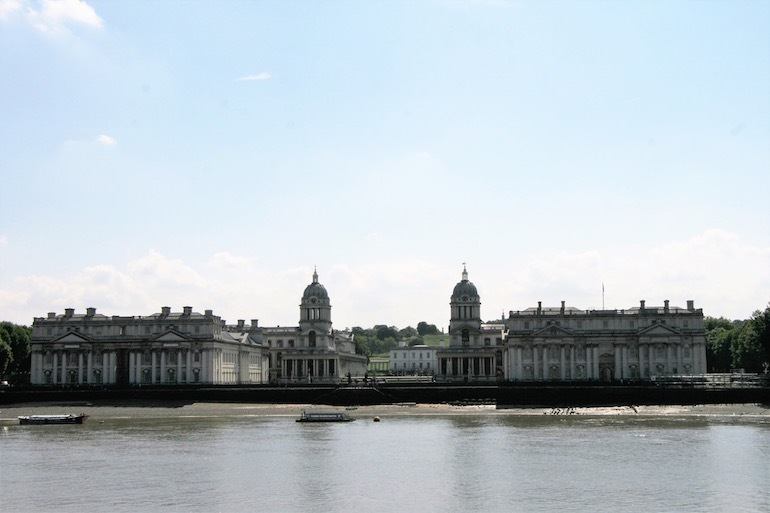 According to Sir Christopher Wren, the esteemed architect behind St Paul’s Cathedral, ‘the best view of Greenwich’ is from Island Gardens, the southern tip of the Isle of Dogs in London’s Docklands. Why is the Isle of Dogs so-called? Some say it’s because the Royal Kennels were housed there. Whether that is true or not, the view of Greenwich is sublime and many would say the best view in London. Ask your Blue Badge Tourist Guide to take you there on the Docklands Light Railway. Hop on a train going to Lewisham from Bank and within half an hour you will be at Island Gardens station. A small park is just across the road, next to the river. Ahead of you is the glory that is Greenwich. 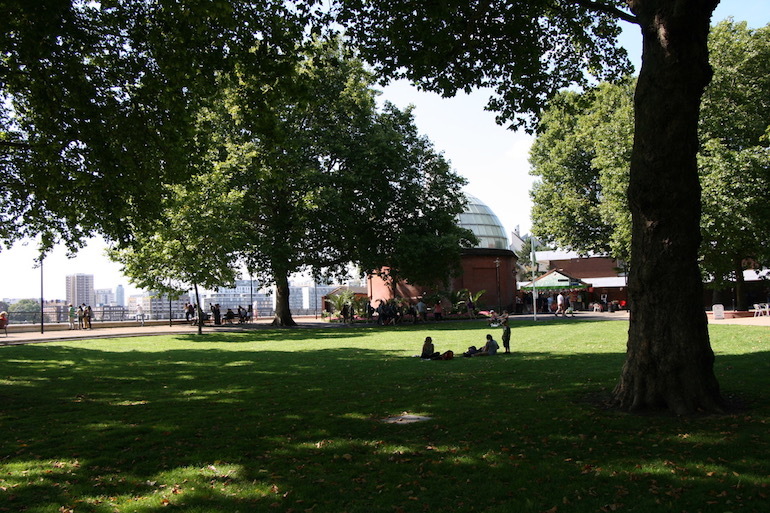 The gardens are now an oasis of peace and quiet for local people, but to begin with, the view was meant not for the people who lived on the Isle of Dogs but for those in the Royal Naval College on the opposite bank. The area was kept free from industrial development so as not to spoil the outlook for the naval officers. The gardens were created in 1895 as a ‘little paradise for local people’ and opened by a prominent Trade Unionist, Will Crooks. Royal Naval College in Greenwich. Photo Credit: © Geoff Marshall. On the right, as one enters the gardens is the entrance to the Greenwich Foot Tunnel. It replaced a ferry. Many workmen from Greenwich had to make the daily trip by ferry to work in the docks and the 1d fare was a considerable sum to pay. And apart from the cost savings, a tunnel allowed those living on the Isle of Dogs easy access to the fresh air of Greenwich Park and Blackheath. Island Gardens TunnelI. Photo Credit: © Geoff Marshall. Instead, there is much to explore near where you are. Head back to Island Gardens Station and (facing the station) turn right along Manchester Road for about 500 yards then left along Pier Street to the Mudchute Park and Farm. If you have young kids, they will love it. This urban farm is an oasis of the countryside in the heart of Docklands; Mudchute was named by local people who took their inspiration from the mud and silt that was dumped here when the docks were being constructed. It became a haven for wildlife. However, in the 1970s, its existence was threatened by the prospect of a high-rise housing development. The locals objected and formed the Mudchute Association to keep the developers away. 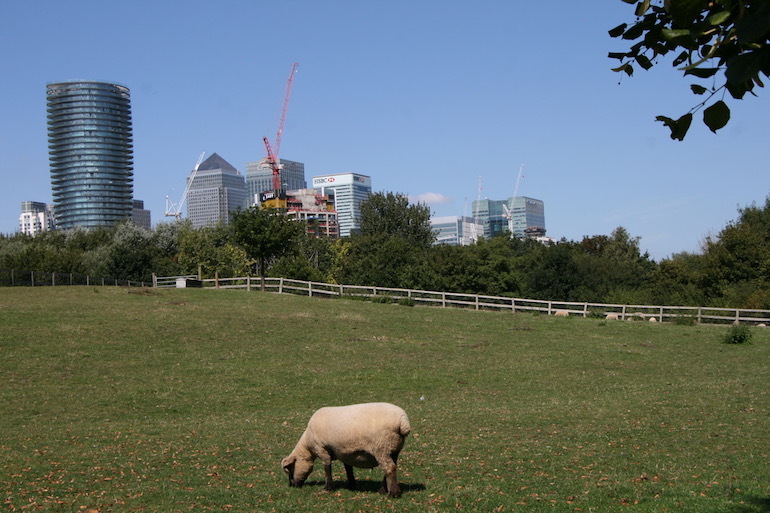 Soon farm animals were introduced and it wasn’t long before Mudchute became the largest urban farm in London. There are all sorts of farm animals here, including a llama. As well as the animals, there is an educational centre, a riding school, nature trail, shop, and café. Mudchute City Farm. Photo Credit: © Geoff Marshall. If that’s not for you, head left at Island Gardens Station for about 400 yards to reach what was once the Millwall Iron Works of John Scott Russell, clearly identified on the left, just past the Ship pub. It was here that Isambard Kingdom Brunel built the Great Eastern for the Eastern Steam Navigation Company. Turn left for the river and Burrells Wharf, within which are buildings surviving from the works. 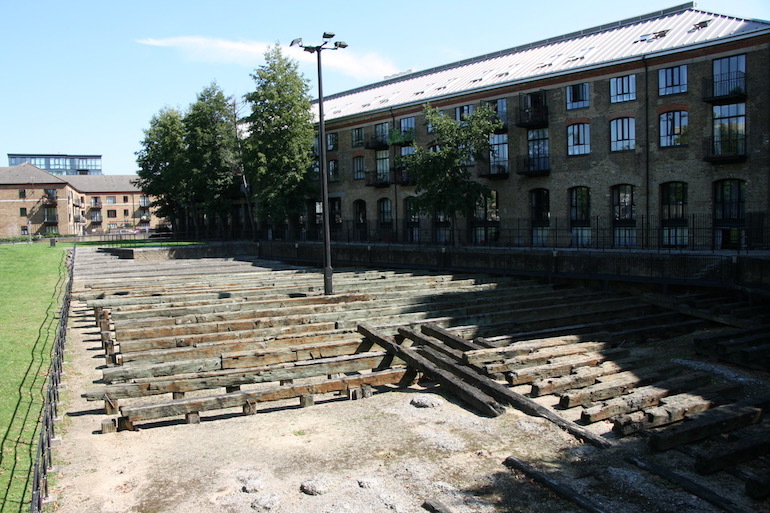 A few yards up-stream are the remains of the timber slipway where the Great Eastern was launched. 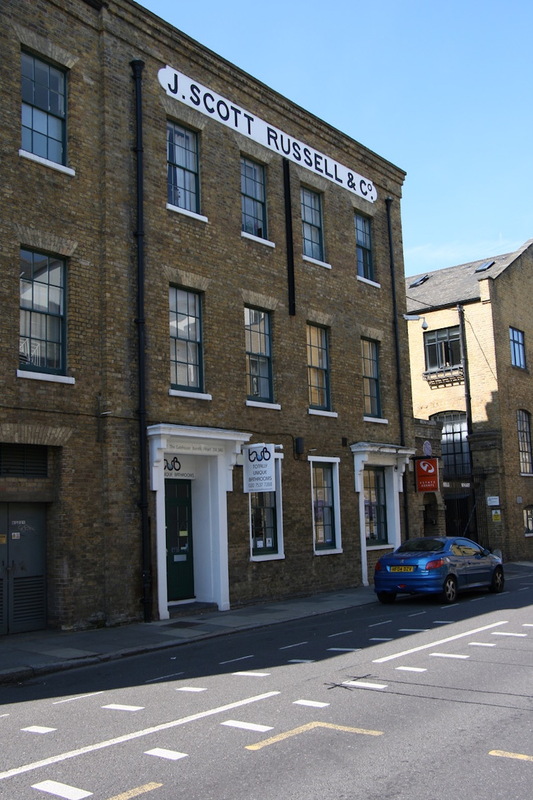 John Scott Russell’s Premises. Photo Credit: © Geoff Marshall. The Eastern Steam Navigation Company sought to exploit the growing trade with Australia but was hampered by having to maintain a string of coaling stations for its ships to refuel en route. The solution was the Great Eastern, which was designed to hold enough coal for the entire round trip, as well as room for plenty of passengers and cargo. The ship’s specification was impressive. She was 211m in length, 37m wide, had a displacement of 22,500 tons and could steam at 14 knots. She could carry 12,000 tons of coal with 800 first-class and 3,000 second-class passengers, or alternatively, there was room for 10,000 troops. By November 1857 the great ship was ready, its vast dimensions necessitating it being launched sideways to the Thames. The date was set for 3 November 1857 and well over 100,000 people gathered, both in Millwall and across the Thames at Deptford, to witness the sight. They came from all sections of society; there were beggars, bankers, dignitaries of the church, old women and young men – but all were to be disappointed! Isambard Kingdom Brunel had devised a complicated system of hydraulic rams, chains, and brakes to launch his ship, but she stubbornly refused to move. One man was killed in the process and others walked off the job. Great Eastern Slipway. Photo Credit: © Geoff Marshall. There followed a series of attempts to get the great ship into the river, all to no avail. In the end, Brunel called in the railway engineer, Robert Stephenson, for advice and the Birmingham firm of Richard Tangye was engaged to provide rams to provide much more force. It worked, both for Brunel and the fortunes of Tangye’s company. As Tangye later remarked, “We launched the Great Eastern and the Great Eastern launched us”. Launching alone cost £172,000, but all seemed set fair in January 1858, with the bells of the church of St Nicholas, Deptford, ringing in the background, as the Great Eastern eventually slipped into the river Thames. 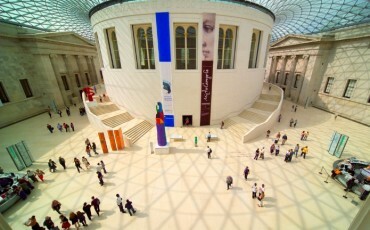 All that remained was for the public rooms to be fitted out. No expense was spared, the contract going to Crace and Son of Wigmore Street, better known for their work for Augustus Welby Pugin at the new Palace of Westminster. Regrettably, the Great Eastern, which cost £920,000 to build, was not a financial success. The Great Eastern did eventually cross the Atlantic and was welcomed in New York by a gun salute from the United States Navy but all thoughts of a round trip to and from Australia without refueling were abandoned when coal supplies were discovered in Australia. She worked the Atlantic crossing for many years but is perhaps better known for laying the first telegraph cable across the Atlantic Ocean. Round off your day by taking the Docklands Light Railway and alighting either at Canary Wharf for a spot of retail therapy or at West India Quay. Ahead and to the west at West India Quay are the magnificent warehouses that once housed sugar and rum imported from the West Indies. Now converted to the fascinating Museum of London Docklands and a mix of restaurants, they provide the venue for a memorable dockside meal with the commercial skyscraper buildings of Canary Wharf as a back-drop. 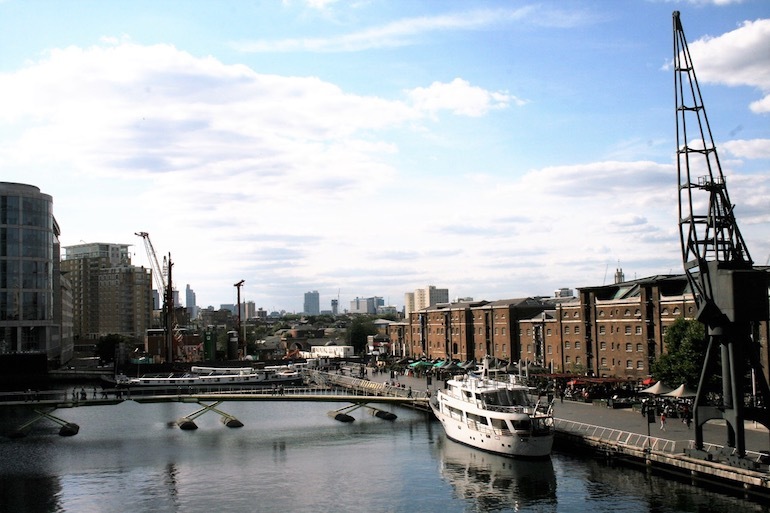 For more on Docklands see the blog “Ten facts about London’s Canary Wharf and Docklands”. West India Import Dock. Photo Credit: © Geoff Marshall. Southwark is a borough in South London that has much to offer visitors. The areas of the South Bank and Bankside are situated by the River Thames and have been a particular draw for many visitors. 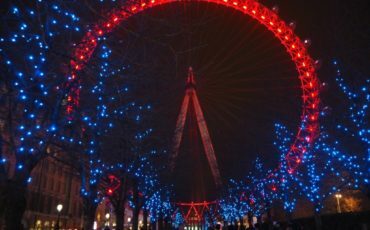 You can stroll along the banks of the Thames any time night or day to enjoy the scenic views, go to the theatres, art galleries, enjoy the street entertainment, seasonal fairs or dine al-fresco. 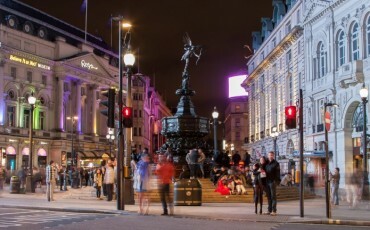 On a recent education and training session, we met in Piccadilly Circus near the Shaftesbury Memorial and the statue of Eros. Fellow Blue Badge Tourist Guide Martin Harvey who led the session started off by talking about "meetings", apparently we were in the ideal meeting place! The only challenge for us initially, was that he was talking in another language – "Polori". Once translated, we understood it was the gay version of Cockney Rhyming slang which facilitated secret communications. So we started on the route from Piccadilly through Soho to Chinatown.